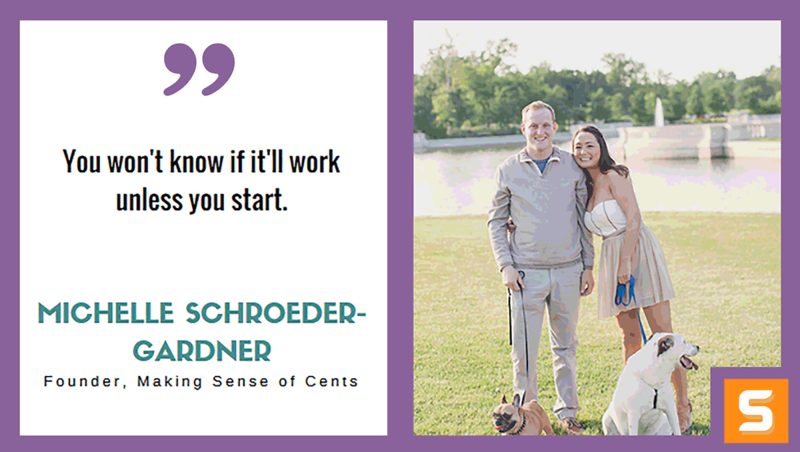 Michelle Schroeder-Gardner is the founder of Making Sense of Cents, a personal finance blog that aims to help people save more, earn more, and live more. She started her personal finance website in August of 2011, when she realized she needed to improve her financial situation and take control of it. She has her Finance Masters and used to work as a financial analyst before writing about personal finance full-time. Michelle and her husband sold their house in 2015 and now travel full-time while earning anywhere from $70,000 to $110,000 a month from her blog. And has a ton of fun running it! In this interview, Michelle shares how she turned her hobby into a profitable and successful business. She also shares what makes her blogging unique, how she handles time/resources constraints, her attitudes/habits, and more. Her biggest piece of advice to bloggers who are thinking to start making sense of their cents: "Think of a blog topic, think of a name, and start creating it." To learn more about personal finance and get daily financial inspiration, follow Michelle on Twitter! How did you get the idea for Making Sense of Cents? Is there something you wanted to do different or better than your competitors? I started Making Sense of Cents in August of 2011, after reading Cosmopolitan magazine (yes, that magazine actually had a good section on personal finance that month!) that featured a personal finance website in one of their magazine columns. I got hooked on that personal finance website and everything just grew rapidly from there. I did not create my blog with the intention of earn a living - it was all just a hobby. At first, I blogged about things I was going through, such as my father passing, living a paycheck to paycheck lifestyle, and other personal topics that I have since deleted from my blog (I used to blog entirely anonymously - even with a fake name!). I then realized how much I loved blogging and realized that it was for me, so now I am a full-time blogger. There are a lot of great personal finance websites that exist, but I set myself apart by doing things a little differently. I focus a lot on living the life YOU want to live, and I try to make all of my content very relatable and realistic. I'm often told by readers that they enjoy my blog because I don't make personal finance boring. Instead, I make it fun. And, that's what I try to do differently. I try to make personal finance as exciting as it can be, so that I can motivate others to take control of their financial situation. I also try to get a rise out of people occasionally, so that they can see how they are wasting their money and holding themselves back in life. For my business, I hope to keep growing, help more people, and create more and more interesting articles. I also hope to finish my personal finance book, possibly create a few ebooks, launch more courses, and so on. I really enjoy all of the aspects that go into running a successful blog, and I hope to continue to help others as well. Five years is a long time, though, especially in blogging years. I have no clue where I see myself in 5 years, as 5 years ago I didn't see myself anywhere near where I am now. Like I said above, I didn't start my website with the intention of starting a business. It was all just a hobby and grew from there. After I started taking it more seriously, it still wasn't "hard" because I had a lot of fun doing it. As the saying goes, "Choose a job you love, and you will never have to work a day in your life." That is exactly true for me. I completely love what I do, so nothing has ever been difficult, it's always been a good type of challenging. Since me and my husband travel full-time, having a stable schedule is hard to come by. Due to that, I try to handle time and resource constraints by working ahead of time as much as I can. Currently, I am around one month ahead when it comes to my writing. This allows me to have a much better work-life balance because I don't have to worry about writing thousands of words all the time. What attitude/habits helped make you successful while starting Making Sense of Cents? I believe one thing that has helped me is that I have always networked with other bloggers. I will help others out, reach out to them on social media, promote their websites, and more. However, many bloggers don't do this because they see other blogs as competition. This is a very bad way to approach blogging as you can learn a lot by networking with other bloggers, plus, they can help you as well! My biggest business mistake that is related to my life is that I used to manage a very poor work-life balance. Working online means that it can be quite hard to stop working, as technically you can work forever and there still would be more to do. Eventually, I realized that I had a problem, and that working 24/7 wasn't good for me. Now, I try to take off most of the weekend, work ahead of time so that I am not stressed trying to complete work, and so on. Managing a good work-life balance is so important! In my cell phone's calendar, I have a to-do list for pretty much every single day. This helps keep me motivated and tells me exactly what I need to complete each day so that I do not forget or procrastinate. We’re huge believers of every entrepreneur keeping their business’ finances under control. How do you keep Making Sense of Cents books in check? I run a very affordable business with Making Sense of Cents. I earn anywhere from around $70,000 to $110,000 a month, and yet my monthly expenses have always been less than $5,000. I know when to outsource and I know how to get the best value when I do need to pay for something. In general, though, running a website is a very affordable business, which allows a person to keep their profits high. What advice would you give to our readers who want to start a business in the US? Where should they start? If someone wants to start their own website or blog, I do have a free course that will help you to start and launch it successfully. It's completely free, and is full of information (over 20,000 words!). Those who are interested can sign up for my free blogging course here. If you want to start, you'll want to think of a blog topic, think of a name, and start creating it. You won't know if it'll work unless you start. Luckily, starting your own blog can be done quite affordably, at less than $100 if you want to do it frugally. That's exactly what I did!